A unique selection of greeting cards featuring independent artists, artisans and small independent companies. We proudly support the sale of greeting cards and postcards produced by local and regional artists and photographers. 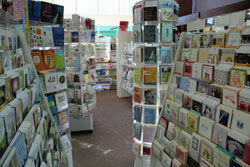 We now have a great selection of Bristol, Rhode Island and coastal themed cards and notes. For the holidays, you will find a great selection of boxed cards, specializing in the nautical theme. The Stacy Claire Boyd Album offers more personalized greetings.